Lawn disease is a serious lawn problem, and one of the most common types of lawn diseases is blight. There are several types of blight that can affect grasses in the Pennsylvania. These lawn diseases can affect specific types of grass, or all grasses depending on the disease. If you’re worried you may be suffering from blight, contact a lawn care professional to assess your lawn and provide you solutions to stop it. Fusarium Blight – Fusarium blight is a very common lawn disease, also known as summer patch. It can be identified by small circles that start out gray but can turn red as the grass dies. Kentucky bluegrass is especially susceptible to this type of fungus. It survives and thrives in hot environments, particularly those that have been affected by drought. Pythium Blight – Pythium blight, also known as greasy spot or cottony blight, is another common lawn disease. It can attack all types of grasses. It thrives in hot and humid climates and can be highly destructive to your lawn. This fungus will turn your grass a reddish brown and make it appear greasy (which is how it got its nickname, greasy spot) over time. Pythium blight can spread very quickly if left untreated, so immediate treatment is crucial. Rhizoctonia Blight – Rhizoctonia blight, also known as brown patch, is a very problematic lawn disease that can be hard to spot. You will be able to recognize the rhizoctonia blight by patches in your lawn that are circular in shape and brown in color, thus the name brown patch. Rhizoctonia blight thrives in an environment that is warm and humid. Bluegrass and fescues are the susceptible types of grass for this particular blight. Blight can be hard to stop once it has started affecting your lawn. That is why prevention is the most important tool. Green Lawn Fertilizing is proud to provide blight prevention with our comprehensive lawn disease prevention system. 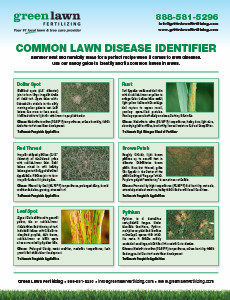 If your lawn already has blight, we’ll examine the situation and let you know your treatment options. Contact us today at 888-581-5296 to find out more about our lawn disease programs.